International ArtExpo, in collaboration with BAC – Bogotá Arte Contemporáneo, is proud to announce the opening of HYBRID MEMORIES, international exhibition of photography, video art, installation and performance art, which will be held in Bogotá (Colombia) at BAC – Bogotá Arte Contemporáneo, from January 14 to February 13, 2015. 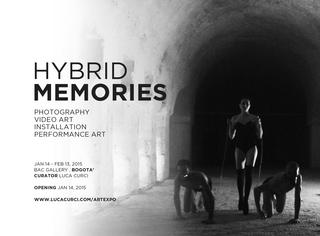 The opening will be on January 14, 2015 at BAC – Bogotá Arte Contemporáneo, at 07.00 PM. HYBRID MEMORIES will analyze the memory of people who live hybrid identities, who live an existence in which different cultures, cities and places are mixed together creating parallel experiences and recollections. The multitude of different identities and roles we play in our contemporary life, all the places we visit and all the people we meet, merged together producing hybrid memories. BAC – Bogotá Arte Contemporáneo is an exhibition space dedicated to display, promote, market and sell the work, practice of contemporary Colombian and international artists. The art held in display will be presented in multiple mediums of expression.